After returning to the finish line on Sunday morning, the kids were just getting ready to leave for their 1 kilometre fun run. Last week, when Little Ironman and I talked about his doing it, he was keen. However, on Saturday morning, he suddenly changed his mind and didn’t want to. Rather than force the run on him, I let it go. “You want to run the 1K?” I asked. “Okay, then, let’s go!” And we jumped right in. The things we do for our kids! First, I had already changed out of my wet running gear and was comfortably warm and dry. Secondly, I was in my old running shoes – the ones that I now wear from day to day. Finally, I wasn’t even wearing a jogbra. Yes, without hesitating, I started to run 1K braless! There aren’t many times that I’m grateful that I’m small; today was definitely one of them.Little Ironman was excited about running. Even when the downpour during the middle part, he grinned from ear to ear, reminding me of how excited my cross-country team is every time they run in the rain because that suddenly makes running an “extreme” sport. We got soaked. Running became “extreme” for LI, again, when we found ourselves hurdling over a dead squirrel in the middle of the road. Luckily, it was fresh roadkill and neither blood nor guts were showing yet. 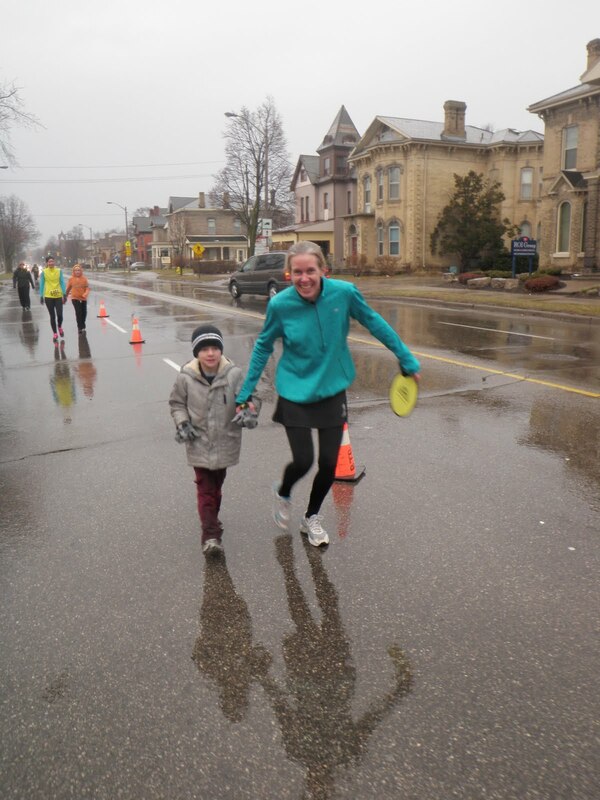 I wondered whether some speedy runner like Krista Duchene from the 5K or 10K had run over it earlier in the morning. Poor squirrel wouldn’t have had a chance crossing her path! I wish I had timed LI because this was his best fun run this year. He took a few walking breaks when he needed to but kept going from start to end. By the time we finished, I needed to change my clothes again. Fortunately, I still had my pants to put on and, thanks to our great race kits, I had a brand new jacket to cover up with and trap in some body heat. LI, of course, had a complete change; I never go to a race without extra everything for him. For me, the Kids’ Race was the hit of the day, braless and all. It’s the spontaneous thrill of running for fun that keeps me chasing my dreams.